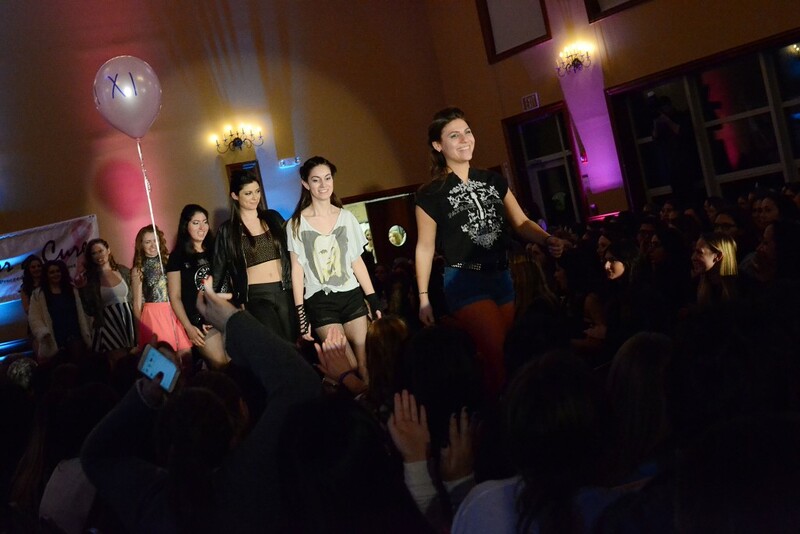 Students danced down a runway Thursday night to country, rock, pop and reggae at Fashion for a Cure, hosted by Chabad of Binghamton and Sigma Delta Tau. The eighth annual fundraiser at Chabad supported Sharsheret, a national nonprofit organization that helps Jewish women facing breast and ovarian cancer. The organization creates a support network of peers and health professionals for women who have recently been diagnosed with or have an increased genetic risk for cancer. This year’s event raised close to $6,000 through a $7 entrance fee and donations, all of which went to Sharsheret. This year’s keynote speaker was Molly Sigel, who graduated from Binghamton University in 2015 with a degree in human development. An ovarian cancer survivor herself, she said Sharsheret was a constant source of support and assistance throughout her battle with cancer. Heather Hulkower, a member of SDT and a senior majoring in human development, helped organize the event. She said that this year’s fashion show was the largest ever, and hosted nearly 500 attendees. According to her, the models were girls from Chabad and various BU sororities, and the clothing came from their personal closets. The fashion show, she said, was a way to raise awareness. There were musical performances by BU a cappella group The Harpur Harpeggios (Pegs) and Arielle Biro, the president of Mu Phi Epsilon fraternity and a senior majoring in biology. Biro is a lymphoma cancer survivor, and she played the guitar and sang for the audience. Members of Sigma Alpha Epsilon Pi, Phi Sigma Sigma, Phi Mu, Alpha Epsilon Phi and Delta Phi Epsilon were all represented at the show, and Hulkower said she was happy to see so many groups. “I love just seeing everyone in Greek Life coming together for a common cause and working towards a charity together,” she said. Gabrielle Sisino, a sophomore majoring in English, said she was especially touched by Sigel’s road to recovery. Rivkah Slonim, the director of education at Chabad at Binghamton, said the goals of the event were to educate people, raise money and awareness and encourage young college students to get behind a larger cause. Sigel added that she thought it was important to make her voice heard, and that this was a good place to do so.